Wheelersburg’s Boo Sturgill scored three runs and drove in two more in Wednesday’s 15-0 win at West. Wheelersburg pitcher Sydney Spence struck out 10 batters in five innings Wednesday night in a 15-0 win over West. WEST PORTSMOUTH — Energy. If Wheelersburg doesn’t have it, coach Teresa Ruby isn’t happy. Coming into Wednesday’s league contest at West, Ruby felt as if her Pirates weren’t meeting her energetic standards. But a magnificent performance from Sydney Spence in the circle and an energy-filled Boo Sturgill on the base paths seemed to change her way of thinking. 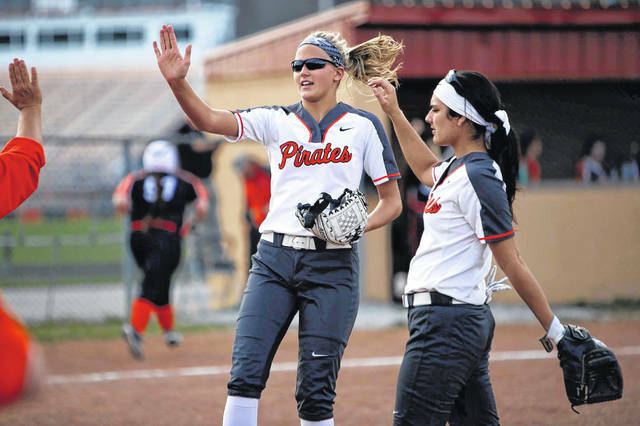 Spence and Sturgill, alongside a hot-hitting Sarah Claxon, led the Pirates (7-1, 4-0 SOC II) to a 15-0, five-inning win over the Senators (2-5, 1-3 SOC II). Spence was electric with the ball in her hand. The junior surrendered just three hits and struck out 10 hitters in a game where her defense only had to produce 15 outs. Meanwhile, Sturgill reached base three times in four trips to the plate and scored on all three occurrences. The shortstop consistently put pressure on West’s defense by taking gigantic leads, making the Senators either throw in front of her to prevent her from taking a base or throw behind her … in which case, she went ahead and took the next base. She ended the day 1-for-2 with a double, three runs, a stolen base and two RBIs. The Pirates put up five hits and six runs in the top of the first inning alone, keyed by a two-run double from Claxon to get the scoring started. Wheelersburg then put up four more in the second, seizing a 10-0 lead, as Sturgill got the inning’s party started with a double. Two additional runs in the third and three more in the top of the fifth produced the night’s final. All in all, the Pirates racked up 12 hits, drew four walks and were hit by two pitches. So far this season, that’s been a regular day for Ruby’s team. The key to keeping the pace? Of course, energy. 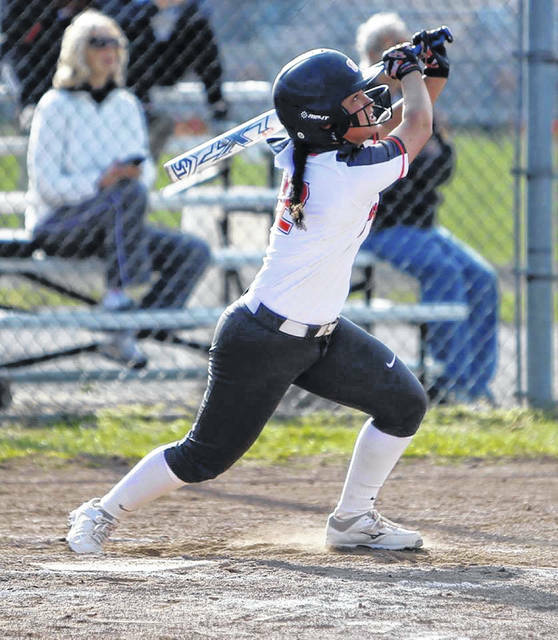 Right along Sturgill at the dish was Claxon, who went 2-for-3 with a double, two runs and three RBIs while Mallory Bergan finished 2-for-3 with a double and two RBIs. Addi Collins also drove in two runs while Laney Eller collected two hits and scored twice. For West, Lainey Ayers, Nataya Richards and Morgan Rigsby each collected a base hit. The Pirates get back to action Friday evening, traveling to Oak Hill, while the Senators try to get back in the win column the same night at Waverly.